Amerks Had to Score Seven Goals to Defeat the Devils · Let's Go Amerks! 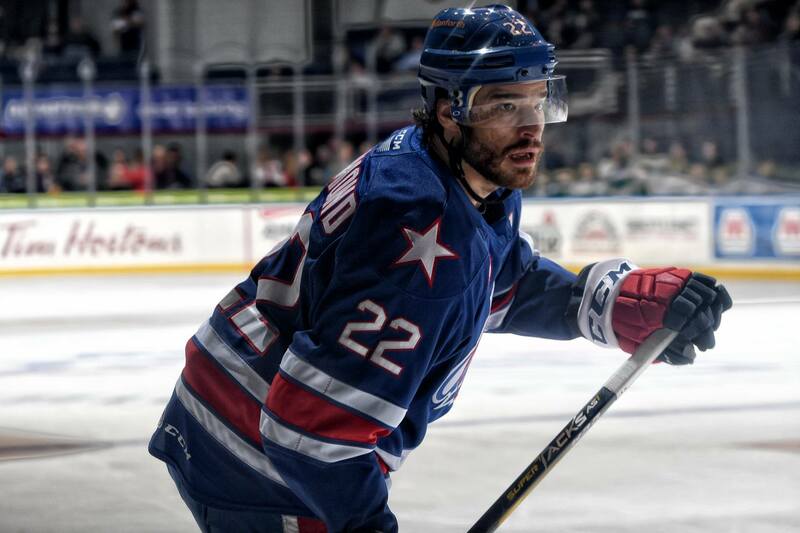 Wednesday night finished with the Rochester Americans having to score seven goals to defeat the Binghamton Devils. How they got to that win wasn’t in the best way possible and the team acknowledged that after the game. Games aren’t always going to be pretty but when you win they’re a little prettier. Zach Redmond scored the game winning goal in the 7-5 win, a goal that counted as his 19th to break the franchise record for goals by a defenseman in the regular season. Unfortunately in the last minute of the game he suffered an apparent ankle injury and had to be helped off the ice. Check back on Thursday for an update. A 3-0 lead heading into the final minute of the first period was looking pretty good. Scott Wilson redirected a shot by Andrew MacWilliam. Victor Olofsson delivered a perfect pass to the blade of Danny O’Regan skating into the slot. Taylor Leier boxed out the defenseman to redirect a Brendan Guhle shot. Nathan Bastian of the Devils scored with 45 seconds left in the period to give the game a slight momentum change. You can see in the highlights or gif below how easily he split the defense, mainly Guhle. Victor Olofsson scored his 14th goal of the season at 8:53 of the second period all alone in front of the net with a pass from Rasmus Asplund who was circling behind the net. After that is when things got a little interesting. The Devils scored three goals in 1:55 to tie the game and make it interesting. Eric Tangradi scored on what would have been goaltender interference in the NHL. Brandon Gignac scored on a breakaway. Nathan Bastian scored his second of the game all alone in the slot. There was a feeling of this could be another loss on home ice after having a lead. Danny O’Regan scored his second goal of the game to regain the lead at 15:27 by tracking the puck and poking in a rebound on the power play. Zach Redmond scored the eventual game winner less than a minute later. One goal by the Devils in the third period wasn’t enough to tie it up again and Wayne Simpson scored an empty net goal with 29 seconds left to secure the win. Borgen, Tennyson, Cornel, Randell, and Nylander were the only five skaters that didn’t tally a point in the game. It was a shooters game with defense playing an after thought. Scott Wedgewood finished with 25 saves for the Amerks and Cory Schneider finished with 23 saves for the Devils. Yes, the same Cory Schneider that has played in the NHL.